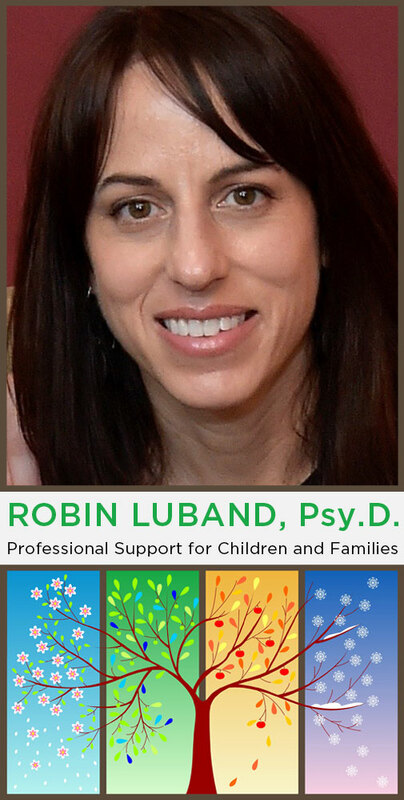 How I Work | Robin Luband, Psy.D. I am a child psychologist because I believe children need to be understood and feel validated for who they are. Children, like adults, fall into patterned behaviors in an effort to get their needs met. Sometimes their behaviors are productive and helpful while at other times, they appear misdirected or problematic. Because their brains are still developing, children are easily overwhelmed by their emotions and at these times, unable to think and process information effectively. Child therapy explores both the patterned behaviors and feeling states that influence how children cope. It’s my job to make connections between what is and what is not being said or acted upon and learn what is motivating that behavior. Once we understand the purpose a behavior serves, we can address the underlying needs that result in the behavior and help both the child and parent respond differently. For these reasons, parent guidance is a critical part of treatment because it allows parents to clarify their decision making and improve their effectiveness. My interest is helping you and your child get the relief you seek. Sometimes changes can be made through discussions between you and me that will lead to sought improvements. Often, I work directly with your child to help them gain the tools they need to change problematic behaviors, improve they way they manage their feelings, and help them get their needs met productively. At other times still, having a parent and child together in session can make the greatest impact. This collaboration between your child, family and myself allows us to gain understanding and determine appropriate supports. My hope for you and your child is that through psychotherapy, you will experience relief, progress and renewed confidence in your child’s ability to manage themselves effectively.